The new BMW X5 has been given a new front apron with larger side intakes. Fog lamps have been repositioned higher and closer to the kidney grille. MIAMI -- BMW's diesel-powered X5 is becoming more popular in the United States, but the big news about the updated crossover has to do with its gasoline engines. A new version of the X5, built in Spartanburg, South Carolina, will be in U.S. dealerships next month. The midcycle changes include a modest exterior face-lift and two new turbo-powered gasoline engines mated to a new eight-cylinder automatic transmission. The X5 has been given a new front apron with larger side intakes. Fog lamps have been repositioned higher and closer to the kidney grille. In addition, more of the surface is painted to match the body color. Also new are optional Xenon headlights with LED corona rings. In the rear, the taillights have been redesigned, the bumper has been reshaped, and the surrounds of the dual exhaust pipes are now painted in body color, matching the new look upfront. BMW's new single-turbo, 3.0-liter inline-six has been added to the 2011 xDrive35i, which replaces the 2010 xDrive30i in the lineup. The twin-turbo, 4.4-liter V-8 has been added to the 2011 xDrive50i, which replaces the 2010 xDrive48i. The V-8 is the same engine used in the X6 xDrive 50i. Production of the U.S. models started this month, and the new X5 should be in most dealerships by early May. Meanwhile, the xDrive35d diesel, introduced to the United States as a 2009 model, remains in the lineup -- and has been drawing more customers. BMW introduced its 50-state clean diesel engine here last year -- its first U.S. diesel in 24 years. Diesels represented 13 percent of total X5 sales in the first half of 2009 and 22 percent in the second half. This year, diesels have accounted for 28 percent of sales, BMW spokesman Tom Plucinsky said at a press event here. X5 U.S. sales totaled 7,953 in the first quarter, up 21 percent from the same period last year. 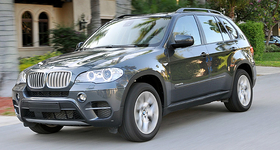 Plucinsky declined to forecast the engine mix on the updated version of the X5. Spartanburg is the sole source of X5 production. The United States accounts for about 30 percent of global volume.